The local show is one of the highlights on the regional events calendar. 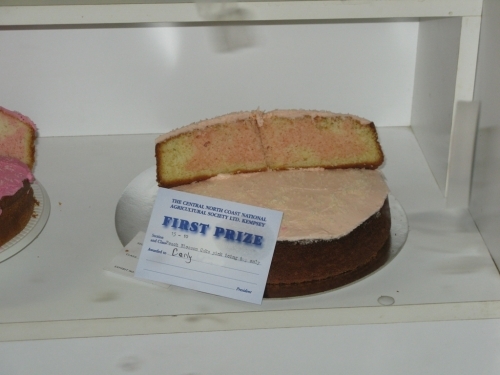 After sizing up the competition at the 2009 shows, I have decided this year will be my first foray into the world of ribbons, taste tests and the pursuit of the perfect sponge. The goal is to first enter the 100th Wauchope Show, and use it as a practice run for my local, the 129th Kempsey Show, a week later. Waz helpfully points out an article in The Argus about a lady from Kempsey winning best Fruit Cake at the Sydney Royal Easter Show. It appears the competition will be tougher than first expected, with the lady in question currently preparing scones, cakes and biscuits to enter into the Kempsey show! 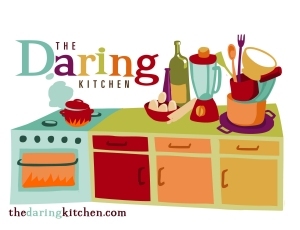 Not being one to start small, I have my goal set on entering the 100th Show Special baking class, attempting to make one Peach Blossom Cake, one Madeira Cake and six scones. I'm also entering six scones separately in another class. Baked items need to be presented fresh, which is why I find myself standing in the kitchen after a long day at work, surrounded by eggs, milk, sugar, flour mixing bowls and tins of all different sizes preparing myself for a night of baking. 6pm: Armed with a Queensland CWA recipe for Peach Blossom Cake, I begin by beating the eggs to stiff peaks, then in a second bowl, cream the butter and sugar, add milk and sift in the flours. Now the tricky part, incorporating eggs whites into a thick cake batter without losing any 'lift'. Then it's time to divide the mixture, colour one half a light pink, then marble together in the cake pan. By 6:30 the mix is in the oven, and I am feeling pretty confident about getting everything done by a reasonable hour. 7:15: The cake is done, and looking sufficiently show standard. No sinking middle, but maybe a touch over brown on the edges, nothing that can't be covered with some icing. 7:30: Time to start cake two. A lovely, buttery and lightly lemony Madeira Cake. Having not even had a practice run on this cake, I'm a bit more nervous. Once again, I cream a heart attack inducing amount of sugar and butter, grate in some fresh lemon zest, add some milk, then eggs and flour. 8:45: The Madeira Cake that had been looking browned and perfectly risen has just slowly started sinking in the middle, taking my show hopes with it. Unlike most cakes, this cake is presented uniced, so no covering of dodgy bits here, it has to be perfect. 9:25: Big mistake. The batter is thin and lumpy and starts leaking out of the cake pan as soon as it is poured in. 10pm Dreams of show glory slowly crumbling, I clear the bench to make room for scones. I'm using a Master Chef recipe here, so not much can go wrong. Except for the fact that I'm tired, don't read the recipe properly and set the oven temperature waaaay too low and end up with perfectly golden rocks. Twice. 6:45am: Up early to make the scones to beat all scones. No mistakes, as there is no time to make a second batch, all of them have to be winners. 7:30: Scones out and looking OK. Tired but happy. I whip up some buttery frosting, tint it a light pink and do the most perfect Peach Blossom icing. 8:30: All boxed and ready to go. Very proud to have achieved what I set out, even though it is far from perfect, I can say I have entered the 100th Wauchope Show. Thanks to WAZ for the 2 hour round trip to drop them off! Total costs: 14 eggs, 1 kilo of castor sugar, 2 kilos of SR flour, 1L milk, 600mL cream, 1 sticky flour coated kitchen, 1 cranky cat, 1 very tired but pleased baker. 3 egg whites, whipped to stiff peaks. 125g butter, 1 cup castor sugar beaten together. Slowly add ½ cup milk, beat well. Beat in 1½ cups SR flour and 1 tsp cornflour. Halve the mixture; tint one half light pink and marble in 20cm tin. Bake for 35-40 mins until golden and cooked when a skewer comes out clean. Ice with a light pink frosting and sprinkle with coconut. Beat together 240g butter and 1 cup castor sugar. Add 1 tsp grated lemon rind, and sift in 2 cups flour and 2 tsp baking powder, mixing well. Mix in 4 lightly beaten eggs. Pour into a 20cm pan and bake for 30mins until golden. Serve sprinkled with castor sugar. Mix 150mL of cream with 150mL milk. Crack in 1 egg and beat together lightly. Sift together 3 cups of SR flour with 2 tablespoons of castor sugar. Mix the wet ingredients into the dry until just combined. Tip out onto a floured bench and kneed together. Cut out rounds with a glass, place on baking tray and brush tops with a little milk. Bake for 12-15 mins until well risen and golden. 2 First for the Peach Blossom Cake at Kempsey. A certificate of participation for everything else :) All good fun.